Scaffolding is used in the construction industry, and its main aim is to ensure that workers are able to do their job on a stable, flat platform, no matter how far from the ground they happen to be. These days, regulations are quite strict with regards to the materials that can be used to construct these platforms, and this is one of the reasons why aluminum scaffolding is so popular; this material is durable, long lasting and lightweight. The construction of aluminum scaffolding on a worksite is basically the same, no matter what type of task is being performed with its assistance, and this includes the standards, which will be used to support the structure from the ground. The equipment will usually obtain support from the base plate, which is placed on the ground. If at any point the scaffolding begins to sway or tilt, it will not meet with the regulations set out by organizations within the country, and this could end up becoming a hazard on the site. When constructed, the scaffolding needs to remain sturdy, and the maximum intended weight limit should not be exceeded at any point during use. Once the scaffolding has been set up on the site, it will then need to be inspected by a professional who will determine whether it meets with industry standards. In terms of aluminum scaffolding, the material will need to be inspected for any damage, and this is something that should be done before and after it is constructed on a work site. If any problems are noted, it should be repaired before it is used again. In many instances, more than one person will work on the scaffolding, but it is important to note that this is not possible at heights exceeding the industry standard. It might be best for individuals to start out by determining how many people will be able to make use of the construction before it is deemed unsafe for others, as this might just have a big impact on the number of accidents that occur on the site. Aluminum is a very popular material to use for the construction of scaffolding, and this is because it is not prone to rust, it will last for a long period of time and it is very lightweight. While it might be more costly to invest in this type of material, the value of the product in the long term makes it more than worthwhile. 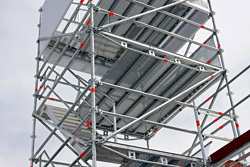 Before choosing to work with aluminum scaffolding on a specific job site, it is recommended that individuals take some time to consider all of the options available to them so that they can make a decision they will be happy with for years to come, as well as increase the safety measures that have already been put in place to prevent accidents from occurring on site.